Plot: Jim Hacker tells Bernard that he is currently up to his neck in the Euro sausage. Implementing European regulations would mean that the British sausage would have to be renamed to the Emulsified High-Fat Offal Tube. Jim is not pleased about this. Jim Hacker asks about his next meeting with Humphrey, but Bernard tells him this has been canceled because Sir Humphrey had to meet the Cabinet Secretary. 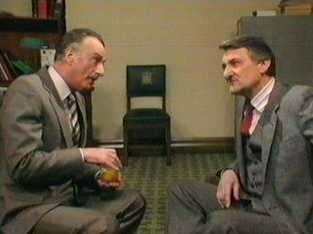 Sir Humphrey visits the Cabinet Secretary Sir Arnold at his office. 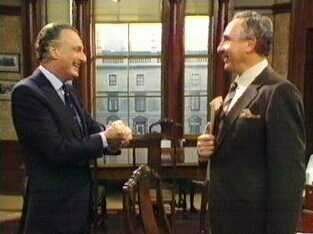 Sir Arnold informs Sir Humphrey that he is going to retire early and that he is assessing who he should recommend as the next Cabinet Secretary. Sir Humphrey asks him what he will be doing after he is retired, as he can continue to be of service to the nation. Together they put together a long list of chairmanships that Sir Arnold is interested in. Sir Arnold further wants guarantees that certain information remains secret after his successor has taken over the job. Sir Humphrey is more than happy to promise this. Now Sir Arnold has decided to recommend to the PM Sir Humphrey as the next Cabinet Secretary. 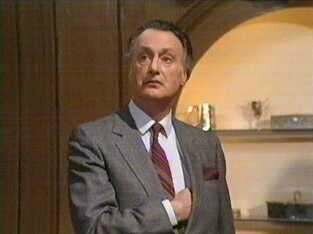 When Sir Humphrey tells Jim Hacker about his new appointment in very vague terms, Jim first thinks Humphrey is about to die and he gets very emotional. As soon as he realises that Sir Humphrey is becoming Cabinet Secretary, he starts to compliment him on his achievements and their marvelous teamwork over the past years. At the Christmas drinks party at the DAA Jim Hacker gets awfully drunk as they bid goodbye to Sir Humphrey. Sir Humphrey thanks everyone for their work at the DAA and reminds everyone of the Home Secretary's campaign "Don't drink and drive at Christmas". Jim Hacker is being picked up for drunken driving however that very same evening, but gets away with it because he can show the Police his silver badge. The Home Secretary was not as fortunate as Jim, as he was also picked up for drunken driving after causing an accident with a lorry loaded with nuclear waste. This causes the resignation of the Home Secretary. Then suddenly the Prime Minister announces he is going to retire in the new year to give his successor a good run-up to the next election. There are two candidates for his succession: Eric - the Chancellor of the Exchequer - and Duncan - the Foreign Secretary. Jim Hacker does not know which candidate he can best support, because if he makes the wrong choice he is out. Both candidates talk to Jim Hacker (he is also Chairman of the Party) and make vague promises that Jim could become Minister at a prestigious department. Jim tells both that he will support their candidature. 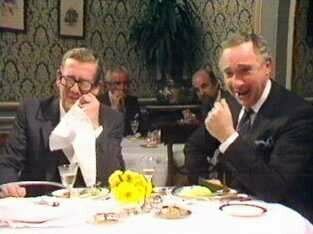 Sir Humphrey and Sir Arnold have dinner together to discuss who should become the next Prime Minister. Sir Humphrey thinks that both candidates have silly notions about running the country themselves and will likely cause a split in the party. Sir Arnold thinks the party should look for another candidate that is more flexible, has no firm opinion about anything and who can be manipulated. They look at each other and burst out into laughter as they realise the perfect choice....Jim Hacker. Sir Arnold advises Humphrey to check out the MI5 files of the two current candidates. When Bernard Woolley joins, Sir Humphrey tells Bernard about the plan and demands that Bernard makes sure Jim Hacker does nothing controversial over the next few weeks. At the DAA Bernard suggests to Jim that instead of supporting Eric or Duncan, he can also go for the Prime Minister job. This makes Jim Hacker think. Sir Humphrey has a meeting with the Chief Whip and he tells him about security question marks regarding both current candidates. He has also invited Jim Hacker to have a look at the MI5 files on the candidates. These files reveal that Eric has not been faithful to his wife and Duncan has made a number of dubious financial transactions. They all agree that both candidates should not become Prime Minister. Then Sir Humphrey asks whether Jim himself is interested in becoming Prime Minister. The Chief Whip is in favour and emphasizes that Jim Hacker should not make his candidature public yet. Jim Hacker first has to make sure the other candidates pull out, using his knowledge about the security question marks. Jim Hacker has talks with both Eric and Duncan about their candidature. He convinces them that they should pull out and support a new candidate who is able to protect them. They both realise the new candidate is Jim, although he denies he has any ambitions to become Prime Minister. Sir Humphrey has arranged a meeting with Jim Hacker and Maurice, the European Commissioner dealing with the Euro sausage. Sir Humphrey tells Maurice that Jim is planning to block any further European harmonization. Certainly now that the EEC wants to ban the British sausage. Maurice gets the hint and they agree that the British sausage can be called the British Sausage, and not the Emulsified High-Fat Offal Tube. At the DAA however, Jim Hacker informs reporters about the plans of the EEC to rename the British sausage, even though the issue has been solved. In a speech broadcasted by the BBC and ITN Jim Hacker speaks out against the EEC regulation to ban the British sausage. He firmly stands up for the British sausage and condemns any intervention from the EEC on this part. In an interview with Ludovic Kennedy he repeats this. When Ludovic asks him about the timing of the speech (during the party leadership election), Jim Hacker states that he has no ambitions to become Prime Minister although if he is asked by party members he will reluctantly accept. As Jim can announce his success in solving the British sausage problem, his candidature is made public. 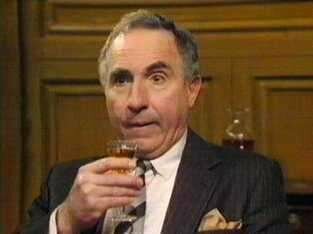 At Sir Humphrey's office he awaits the result of the party vote. When it finally gets in Jim wants to know whether he has become PM. Sir Humphrey can say: "Yes, Prime Minister". Sir Humphrey: "Minister, I have some very grave news." Sir Humphrey: "The relationship which I might tentatively venture to aver has been not without some degree of reciprocal utility and perhaps even occasional gratification, is emerging a point of irreversible bifurcation and, to be brief, is in the propinquity of its ultimate regrettable termination." Sir Humphrey: "I am...on my way out." Sir Humphrey: "There comes a time when one has to accept what fate has in store, when one passes on..."
Sir Humphrey: "...to pastures new, perhaps greener. And places oneself, finally, in the service of one who is greater than any of us." Jim Hacker: "Humphrey, I am so sorry." Sir Humphrey: "Oh, thank you, Minister." Jim Hacker: "Does lady Appleby know?" Sir Humphrey: "Well, she suspected it for some time." Jim Hacker: "When did they tell you?" Jim Hacker: "How long did they give you?" Sir Humphrey: "Oh, just a few weeks." Sir Humphrey: "But it will give me enough time to sort everything out." Jim Hacker: "Humphrey, you are so terribly brave." Sir Humphrey: "Well, one is a little anxious, of course. One is always a little wary of the unknown, but I have faith somehow I will muddle through. [Jim Hacker starts crying] Minister, what is the matter?" Jim Hacker: "I am sorry, Humphrey. Just, well we had our ups and downs." Sir Humphrey: "Oh Minister, do not take on so. We will still be seeing one another regularly. Yes, once a week at least." Sir Humphrey: "I have not told you where I am going yet. I have been appointed Secretary to the Cabinet." Jim Hacker: "Secretary to the Cabinet?" Sir Humphrey: "What did you think I meant?" 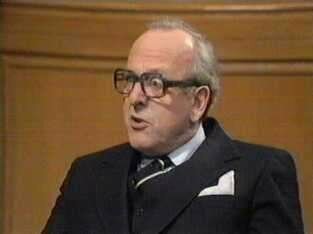 Jim Hacker: "I thought, I..., I...."
Sir Humphrey: "How are things at the Campaign for the Freedom of Information, by the way?" Sir Arnold: "Sorry, I cannot talk about that." Sir Humphrey: "There are certain items of confidential information which while in theory they might be susceptible to innocent interpretation, do nevertheless contain a certain element of, shall we say, ambiguity, so that were they to presented in a less than generous manner or to an uncharitable mind, they might be a source of considerable embarrassment, even conceivably hazard, were they to impinge on the deliberations of an office of more than usual sensitivity." Jim Hacker: "I am sorry?" Chief Whip: "He is talking about security questionmarks." Sir Arnold: "So, will our new PM be our eminent Chancellor or our distinguished Foreign Secretary?" Sir Humphrey: "Well, that is what I wanted to talk to you about. Which do you think it should be?" Sir Arnold: "Difficult. Like asking which lunatic should run the asylum." Sir Humphrey: "So we trust you to make sure that your Minister does nothing incisive or divisive over the next few weeks." Sir Arnold: "Avoids anything controversial." Sir Humphrey: "Expresses no firm opinion about anything at all. Now, is that quite clear?" Bernard Woolley: "Yes, well, I think that is probably what he was planning to do anyway." Jim Hacker: "As far as world politics goes, of course the Foreign Office is just an irrelevance. We have no real power, we are just a sort of American missile base." Jim Hacker: "They can stop us calling it a sausage though. Apparently it has got to be called the Emulsified High-Fat Offal Tube." Jim Hacker: "So Humpy, you are going do to the Prime Minister what you have always done to me......for me." Jim Hacker: "Obviously the Home Secretary will have to resign." Jim Hacker: "What on earth will happen to him?" Sir Humphrey: "Well, I gather he was as drunk as a lord, so after a discrete interval they will probably make him one."